Youth at the Cook County Juvenile Detention Center at an event in 2014. A WBEZ investigation found that kids spend weeks, or even months, in the jail because DCFS can’t find a place for them to live. There’s a kid in the Cook County juvenile jail right now who isn’t supposed to be there. A judge ordered his release on January 29. Because he is a juvenile, WBEZ isn’t using his name, but his problem is not unique. Even after a judge has ordered their release, lots of kids wait weeks, even months to be picked up. Their deadbeat guardian is the State of Illinois, and these kids are stuck in juvenile jail because the Department of Children and Family Services (DCFS) can’t find a place to put them. 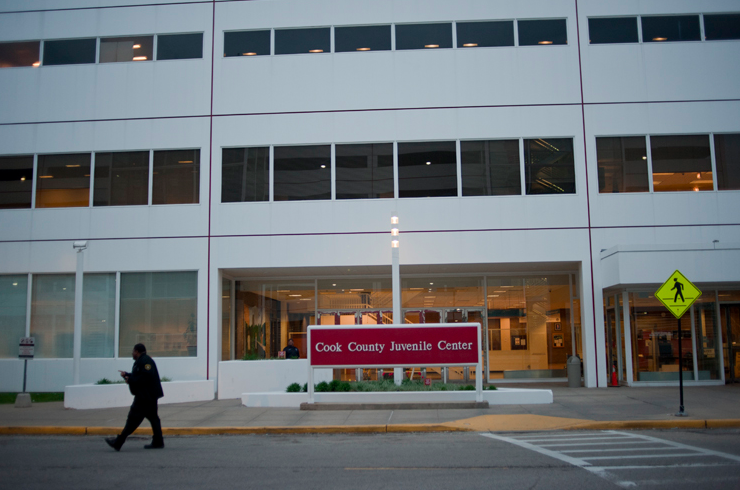 A WBEZ analysis of data from Cook County found that in the three-year period between October 2011 and October 2014, there were 344 instances when kids waited a week or more in the jail for DCFS to come pick them up. Last year the longest wait was 190 days—more than half the year. And it’s not just that there are a lot of young people waiting. They are waiting specifically because of the failures of DCFS. Kids get sent to the juvenile jail for a number of reasons. Some are waiting for trial, others are serving a punishment. No matter who they are or why they’re there, kids can’t leave unless someone comes to take custody of them. The data doesn’t account for how many of the 344 times involved the same kid held more than once, so to check on daily counts, we asked jail staff to give us a snapshot of every kid who was waiting to be picked up. On the day we asked, Oct. 16, 2014, there were 19 kids in the jail who had been ordered released by a judge and were just waiting on a guardian to pick them up. Thirteen were waiting for DCFS. “I think it sends a very disturbing message to a child to say there’s no reason for you to be held in detention, but we’re not working hard enough, or we’re not making you enough of a priority to find a place for you to go,” said Bruce Boyer, the director of the Civitas Childlaw Clinic at Loyola University Chicago. ”We’re talking about children that a judge has looked at their case and said, ‘There’s no risk here. This child should be at home or in a community based setting, whether it’s a foster home or somewhere else.’ So, that’s incredibly disruptive to the child,” he said. Antoine Brown has lived through that disruption. Brown is 25 now and lives in Marion, Illinois. But when he was 14, Brown spent about six months in Cook County’s juvenile jail waiting for DCFS to find him a bed. Jennifer Vollen Katz with prison watchdog John Howard Association says Brown’s frustration is typical for kids stuck in jail. “You will see the behavior begin to deteriorate, because that’s just an incredibly high level of frustration for a young person to grapple with,” Vollen Katz said. Vollen Katz says that’s especially bad because this is a population at a crucial point. The choices they—and their caregivers—make will decide if these kids move on from a troubled childhood to become successful adults, or get stuck in the so-called prison pipeline. “The system has failed them time and again, so for the system to tell them, if you do this then you’re gonna get to go and for that not to actually happen, I think is just another indicator that trusting authority is probably not a safe bet for some of these kids," Vollen Katz said. "And that’s not a message we want to be giving them." Boyer says many of the kids forced to wait have been in the child care system for most of their lives. Often they’ve been abused or neglected, passed from foster home to foster home. That means most of these young men and women truly have special needs. “These are the needs that really require treatment, whether it’s counseling or other kinds of services. And these are the sorts of things that frankly are just not available in the detention center,” Boyer said. DCFS spokesman Andrew Flach says the department is aware of kids languishing in jail, but right now the department isn’t planning any changes to fix it. Flach says more money would help, but the state also needs more well-run residential treatment centers able to care for these children. Flach believes leadership from new Director George Sheldon will eventually fix problems like kids waiting in jail. Loyola’s Bruce Boyer says the best way to address the problem is to keep kids out of jail in the first place. Cook County estimates that it costs more than $500 a day to house one person in the juvenile temporary detention center. And those instances when kids waited a week or more—the time they spent waiting on DCFS adds up to more than 7,300 days in Cook County juvenile jail. That’s almost $4 million taxpayer dollars spent over three years. And for all that money, the kids didn’t get special counseling or intensive therapy. Instead, they got all the wrong lessons about the justice system, and a pretty direct message that they don’t matter. At least not enough. Patrick Smith is a WBEZ producer and reporter. Angela Caputo also contributed reporting for this story.